Links to print interviews with David. It was recently reported that Paramount will not release Deep Space Nine on Blu-ray, a real bummer for those of us who feel that, after the original series, DSN was the best Star Trek show. But while we may not be getting those classic stories in high-def, we are getting new ones courtesy of such writers as David R. George III, whose latest novel, The Long Mirage, in the grand tradition of the show, builds upon some plot points from earlier episodes—I mean novels. TrekCore’s literature editor Dan Gunther caught up with prolific Star Trek novelist David R. George III this month, who returned to the Enterprise-B and the time period between the original series and The Next Generation known in his new release, The Lost Era: One Constant Star. StarTrek.com recently grabbed a few minutes of David R. George III’s time for an interview in which he shed some light on his most recent novel, One Constant Star, set in the Lost Era. As we reported last month, Star Trek: The Fall, a new five-book miniseries bridging the adventures of Star Trek: The Next Generation and Star Trek: Deep Space Nine, is launching from Simon & Schuster, beginning with David R. George III’s newest release, Revelation and Dust. TrekCore’s literature editor Dan Gunther caught up with the author earlier this month. In the wake of Star Trek: Into Darkness, we take a look at the vast and often baffling world of Star Trek books and their place in the Trek universe. Be warned, Trekkers: spoilers detected on long-range scanners. This article includes the sidebar “Vulcan Love Slave”: author David R. George III talks fan reaction and the future. Star Trek: The Fall—a five-part The Next Generation/Deep Space Nine crossover penned by five popular authors, with covers created by three Trek artists—won’t kick off until, well, the fall. But we here at StarTrek.com are so excited about the upcoming Simon & Schuster project that we’re devoting several days of coverage to it, including interviews and art. Here, you’ll find a synopsis of Revelation and Dust provided by Simon & Schuster, and under that, you’ll find an interview with David R. George III. StarTrek.com has a synopsis of David R. George III’s latest original series novel, and we also grabbed a few minutes of George’s time to discuss Allegiance in Exile and his next Trek project as well. Today, in the second half of our StarTrek.com interview with David R. George III, the prolific author talks in more detail about his current projects, the Typhon Pact novels Plagues of Night and Raise the Dawn, which will be released on 29 May and 26 June, respectively, by Simon and Schuster. George also discusses his other Trek work—such as writing a Deep Space Nine novel with Armin Shimerman and co-writing the story for the Voyager episode "Prime Factors"—as well as assorted upcoming endeavors. StarTrek.com caught up with David R. George III for an extended and extensive interview spanning from when he sat, spellbound, watching the first original series episode he ever saw, “The Corbomite Maneuver,“ to his earlier Trek efforts, and from the new Typhon Pact books to his upcoming projects. 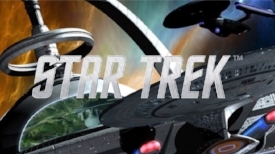 Below is part one of our interview, and visit StarTrek.com again tomorrow to read part two.